As a part of Nu-Soul's mission to bring you the finest in soul and electronica and everything in between, we have an exciting new addition to our Strictly Social event on September 27th. 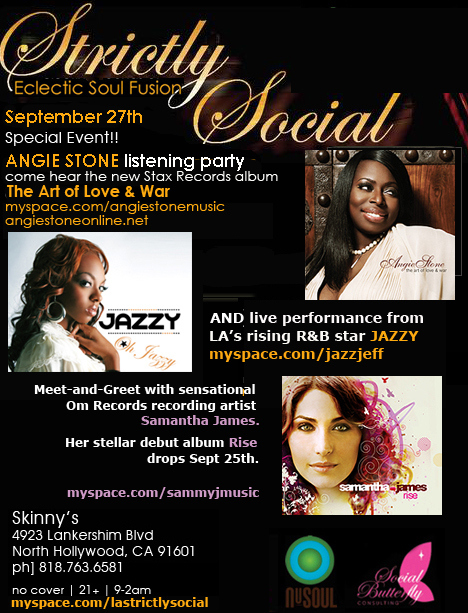 We will have a special Meet-and-Greet with brand new Om Records recording artist Samantha James. Samantha's smooth voice and empowering lyrics landed her a #1 song on the Billboard dance charts with her single "Rise". Nu-Soul Magazine presents the next Strictly Social Special Event on September 27th. This month experience the beauty of Angie Stone's new album The Art of Love & War, in stores October 16. Be one of the first to hear this new instant classic from the reactivated legendary Stax Records. The new album marks a creative rebirth for Angie Stone, channeling the best of the soul tradition with a fresh and modern sound. The night will also feature a special live performance from rising Los Angeles R&B talent, Jazzy! 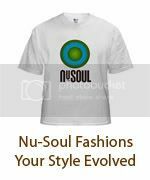 Join Nu-Soul Magazine and Strictly Social every month for performances, listening parties, giveaways and more! Strictly Social is a weekly event representing the sounds of eclectic soul fusion at the beautiful and classy Skinny's in North Hollywood. This lounge setting is the perfect environment for the future soul vibe on Nu-Soul Magazine. DJ ?uestlove this Sunday in LA! FREE!